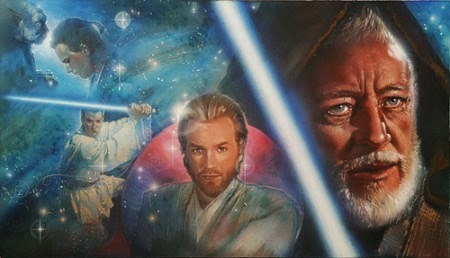 John Alvin and his amazing Star Wars artwork. Famed movie poster artist John Alvin not only created the highly regarded Star Wars Concert, the 10th Anniversary Star Wars, and the first several official Star Wars Celebration posters, he was also offered the job of working on the campaign for A New Hope, but had to turn it down because he was in the middle of several campaigns for Mel Brooks. 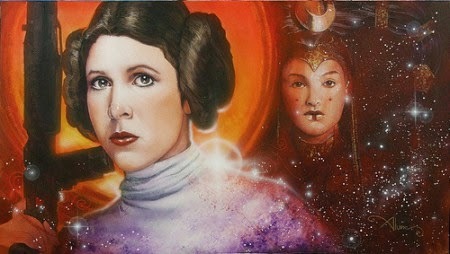 Many Star Wars aficionados and movie fans know John Alvin’s work. As the recent book “The Art of John Alvin” shows, he worked on hundreds of movie campaigns, and was a favorite of both George Lucas and Steven Spielberg. He created more poster campaigns for Spielberg than any other artist. While Alvin was alive, George Lucas took full advantage of the contract requiring his right of first refusal for purchase of all official Star Wars art, resulting in his having the largest collection of Alvin Star Wars related artwork in the world. Early February is tough for those of us who knew John Alvin, as well as for those who have come to know his work through his many movie campaigns through which he “created the promise of a great experience”, as John used to say. John passed away February 6th in 2008. Fans who met him and those who were lucky enough to work with him or be mentored by him as artists know what a humble, genuine, and big hearted man he was. As his friend I still miss him. As the art gallery owner who worked directly with him while he was here, represents his estate, and continues to advocate for traditionally illustrated movie posters, I can say unequivocally he is irreplaceable. Many is the time I think about what an amazing job John would be able to do evoking the spirit of a new film with his uncanny ability to blend a concept, perfect on-model portraiture, and that unnamable something that excited people to get up and go to the movie theater the folks at Disney labeled “Alvin-izing”. John embodied the best of what an artist should be in every way. It’s hard to imagine what it was like, not that long ago and what seems like an eternity away, before digital, photographic, and photoshopped images, when illustrators were routinely given all the jobs of creating campaigns and printed advertisements by hand. These illustrators took whatever jobs given to them, whether they liked the subject or not. Nowadays if someone works on Star Wars art, it is out of love and fandom, in addition to wanting a paid job. John Alvin, however, was one of the biggest Star Wars fans anyone could imagine. His house was filled with models of X-wings, Landspeeders, and all the other crafts fans might want to build. He had finished and painted an enormous version of several, for which he lovingly build special plexi displays. 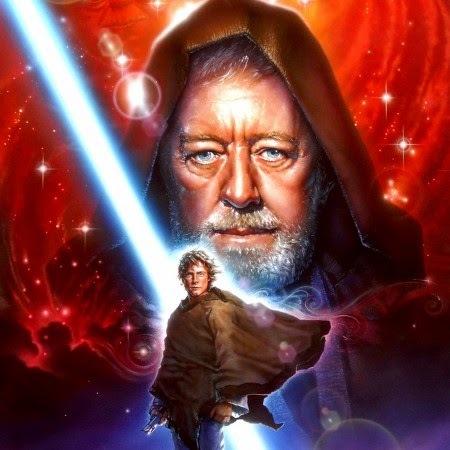 So when some years ago he approached George Lucas with an idea for art inspired by the genealogy of the Star Wars characters, a project he called “The Force of Influence”, George was aware that John knew his chronology, his characters, and his spacecrafts well enough to create some great images. This began a great series of inspired originals that we hope one day will be shown on exhibit. There were a few pieces that begot limited editions, notably “Like Father, Like Son”, and “A Destiny Unfolds”. It is a shame that he was only in the studies phase of his latest pieces when he passed away. I remember he had a great deal of fun coming up with the names of each piece. Examples were “A Shadow is Revealed” and “A Master Learns The Truth”. His names all had such sincerity and gravitas. Since the finished originals were quite large and complicated, he often did studies before executing the larger originals, which gratefully sometimes George wouldn’t buy, as he knew he was getting the big fancy version. This allowed me the honor of selling a few of them to my favorite Star Wars collectors. One piece, I should be, but am not ashamed to say, had me a bit teary as I wrapped it up to send home with a client. For the life of me I can’t remember the name of that one, and I’m loathe to make up my own name. He hated when I did that! What strikes me now, as the new Star Wars film is being prepared for release, is how excited John Alvin would be not only to see the newest film, but also to take back up the challenge of creating new images in his Force of Influence art series. Perhaps his style of art, as painterly, visually evocative, and romantic as they are, aren’t what is in vogue now. Minimalist images based on “in-jokes”, recalling sometimes a derivative version of the great Saul Bass, are all the rage. I can tell you that those who create art now for LucasFilm, including many of those who are in this year’s Star Wars Celebration art show, remain loyal fans of his work and would consider John Alvin himself a force of influence. I know Jeff Carlisle, Matt Busch, and Randy Martinez all spoke to John frequently as younger artists and have told me they found his art style, eternal enthusiasm, and wisdom inspiring. While it is a shame we won’t see any art relating to the new films or see any new art at this year’s Star Wars Celebration from the great John Alvin, we have his Force of Influence and can be grateful his love of Star Wars led to an art series that speaks to the validity of film art as “real fine art”. These early February days, that is something that his friends and fans can celebrate.